Bone broth is an ancient healing food that is not only delicious but also comes packed with everything your body needs such as digestion and improved energy levels. 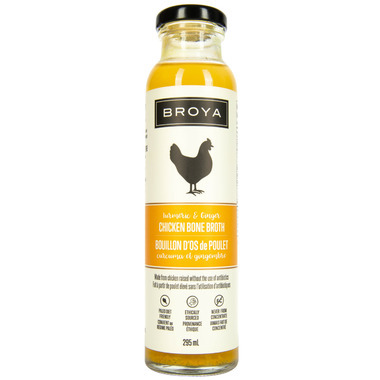 Broya Turmeric & Ginger Chicken Bone Broth is made from free- range organic chicken bones and organic vegetables and spices. 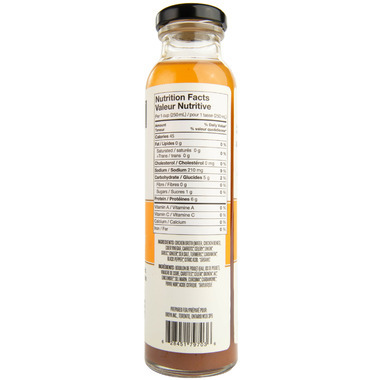 The chicken bone broth is simmered for up to 24 hours for a savory, great taste! A good broth to use in a pinch - tasty very convenient however it is a bit pricey. If you don't like turmeric then do not go for this one. I made a batch of couscous with it as the base. A nice way to add flavour and extra nutrition to my dinner. This is a great product. I use it in making soups. Very good! For my first time trying bone broth... this product is delicious! I wish it was cheaper though - I guess I'll need to learn how to make it myself! I was a bit worried about what it might taste like at first. I had nothing to worry about it. It's a very good quality clear sipping broth. It's fresh tasting and full of flavour. Just heat and serve for a fast snack. Great on its own or use it to prep another dish. This is not your usual store bought bone broth... itâ€™s delicious, comforting and flavourful, just as if you made it yourself. Wholeheartedly recommend it! Drink it straight or add it to food. It's delicious. Delicious and convenient. Such an easy way to add Bone Broth to my diet.